It has been some time now that people are opting out of buying tablets. They mostly just go for big-screened smartphones (also known as phablets) instead of buying a separate device for entertainment. Many reports have suggested that tablet sales have dwindled in the last few years. Amid this, Samsung has launched its Galaxy Tab A (2017). We spent a few days with it to know what's good in it and what's not. And more importantly, we wanted to know if the tablet has enough in it to make someone pay Rs 17,990 on a device solely for entertainment. We quite liked the design of Samsung Galaxy Tab A. The tablet has an 8-inch screen and comes with a plastic body with a glossy finish. Although we prefer the design of gadgets that come with a metal body instead of plastic one, the Samsung Galaxy managed to look good even with it. Samsung's new tablet measures 212.1mm x 124.1mm x 8.9mm. This makes it long, but not very wide. We liked this factor because it made the Galaxy Tab A more portable. You can even fit it in your handbag, and because it is also lightweight, you wouldn't have a problem carrying it around. On the right edge you'll find the power and volume rocker button and on the left edge is the microSD card slot. The top edge has the 3.5mm jack and the microUSB port, and speaker grilles is on the bottom. The back panel of the Samsung Galaxy Tab A is smooth and makes it comfortable to hold the tablet for long durations. You can even hold it one hand and work on it with the other. The tablet also comes with rounded edges which make it easy to grip. Gadgetsnow said they loved the display of the tablet. The images appeared sharp, and the colours were bright and vibrant, but still accurate. We do come across displays of various smartphones and tablets which can make colours look saturated, but Samsung Galaxy Tab A isn't one of them. The viewing angles are good too and we faced no problem using the tablet even in sunlight. And this, we think, is a big plus. We spent hours watching videos and looking at pictures on the tablet, and it was such a visual treat that it was almost addictive. 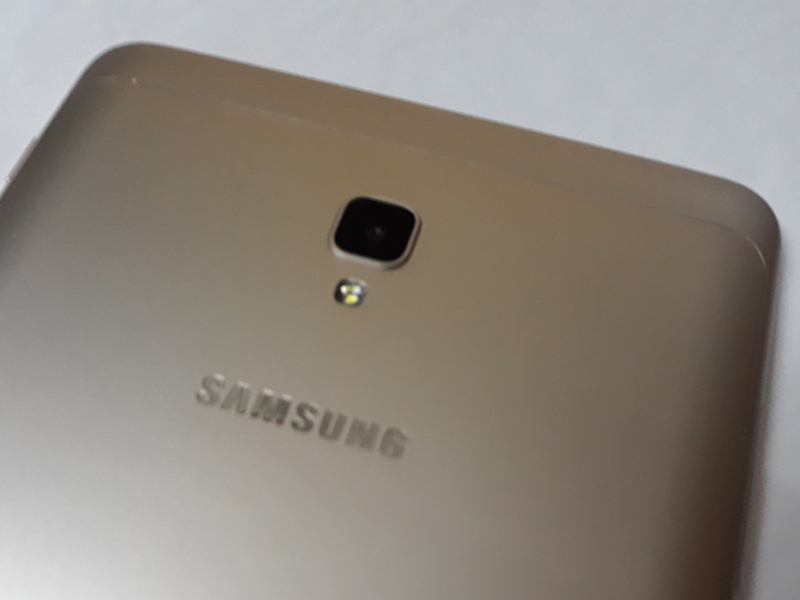 To sum it up, we would say that the overall look and feel factor of Samsung Galaxy Tab A was impressive. 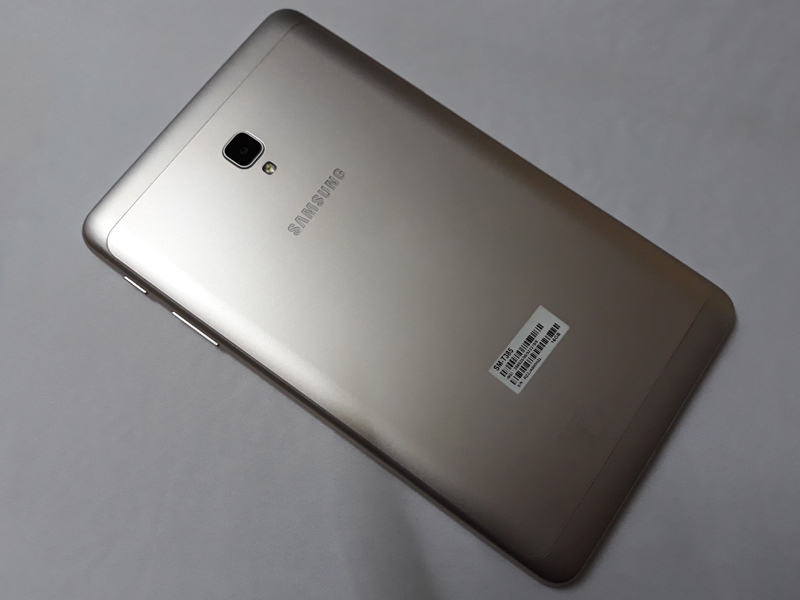 It is powered by a 1.4GHz quad-core processor of unknown company. The device runs Android 7.1 Nougat out-of-the-box and has a single-SIM functionality. For storage, the device offers 2GB RAM and 16GB ROM (of which 9.7GB is available). Users can also install microSD cards of up to 256GB. The tablet is backed by a 5000mAh battery and offers 4G, 3G, 2G, Bluetooth, Wi-Fi as major connectivity options. The tablet runs Android 7.1 Nougat. Speaking of the software experience, it was user-friendly, easy to navigate and doesn't have bloatware - which we think is a big plus. There is a usual Google's suite of apps, and apps from Microsoft too. Besides that there were a few native apps from Samsung. Having Microsoft's apps on the tablet means that you can use the tablet for work as it is way easier than using Word on a smartphone. The apps launched in no time, and switching between them was a cakewalk. Same was the case with Chrome tabs. We opened multiple tabs, but faced no lag because of it. If you swipe right on the home screen, you'll be taken to Samsung's Bixby assistant. Bixby gives users customised cards on the basis of their usage of the device. So you may be shown upcoming events, YouTube videos you may be interested in, your most frequently visited webpages, content from various news agencies, and more. The tablet also handled multi-tasking like a breeze. Even when we tried to do three things at once, we didn't face any lag. We used it for navigation almost everyday for over an hour, and didn't encounter any heating issues with it. We also used various social media apps like Facebook and Instagram and watched YouTube for hours. Samsung Galaxy Tab A handled it all. However, one thing that did take time to load was games. The gaming experience on the tablet was something that we didn't enjoy too much. They always took a while to start and even switching between a game and app wasn't as pleasant as rest of the experience. We even used the tablet for reading e-books. For us, the experience was a smooth one. So unless you are too accustomed to using one particular tablet for reading, Samsung Galaxy Tab A wouldn't disappoint you. The cameras of the tablet do a decent job. In terms of camera, the device offers 8MP rear camera with LED flash and a 5MP front camera. The 8MP primary camera clicked decent images in well light areas, although when we tried clicking images after zooming in, the quality deteriorated. In dimly lit areas, the quality of images was not as good as the ones taken in well-lit conditions. The selfie camera does a good job. Don't compare it to the front facing camera of selfie-centric smartphones, because it doesn't match up to them. But you surely can click clear selfies which look even better with beauty feature on. The battery of the tablet lasts for over a day with usage that involves navigation, watching YouTube videos, browsing the internet and listening to music. We ran some benchmark tests on Samsung Galaxy Tab A and it scored 35940 in Antutu and 658 and 1821 in Single core and Multi core scores of Geekbench 4.